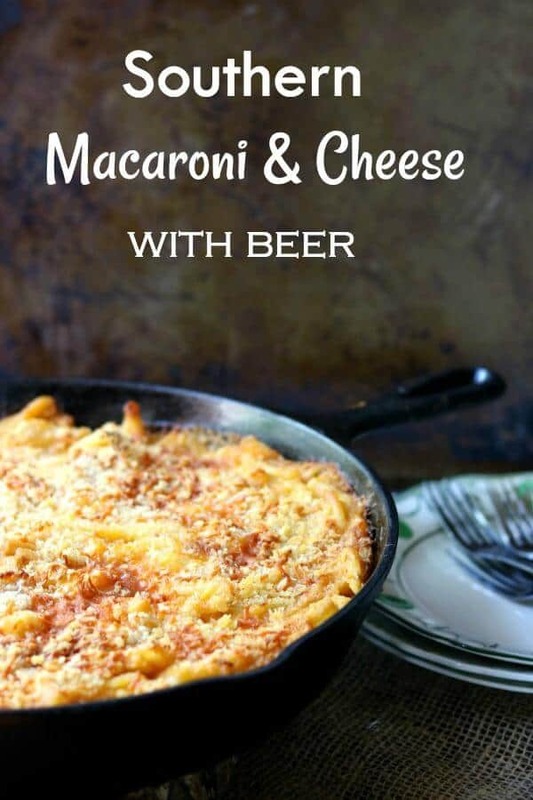 Southern baked macaroni and cheese with beer is creamy, gooey-cheesy like the mac and cheese your kids love but the beer wraps around the flavor and coaxes it to a level that makes your mouth take notice. The classic comfort food that we grew up on has grown up, too. 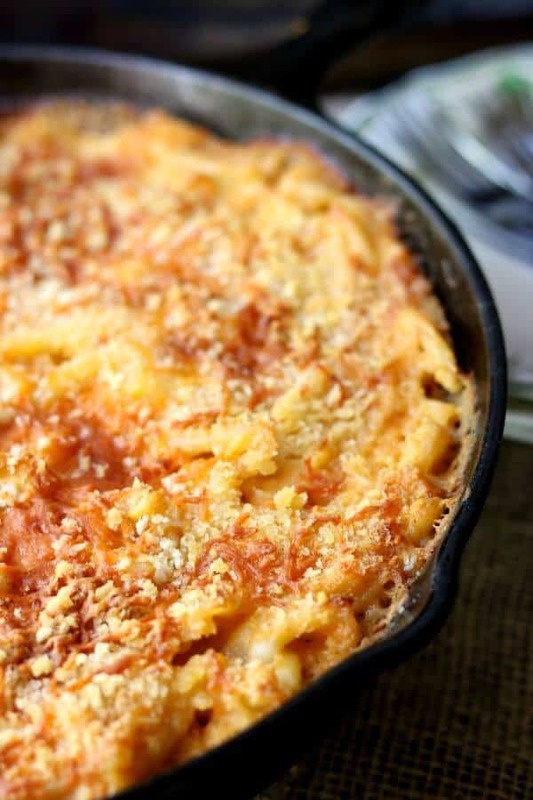 Baked macaroni and cheese has always been a favorite around here. I was lucky enough to be part of the last generation that grew up with real mac and cheese – not the stuff that came from a box. My mom didn’t make a super creamy variety – hers was pretty basic with just macaroni, cheese, a little milk, and a lot of pepper. I still like it that way sometimes – not creamy at all but gooey with big, melty squares of oozy cheese holding the macaroni together. Over the years I’ve warmed up to the creamy macaroni and cheese recipes – the kind where a rich cheese sauce just sort of cuddles around the macaroni. You know what I mean. 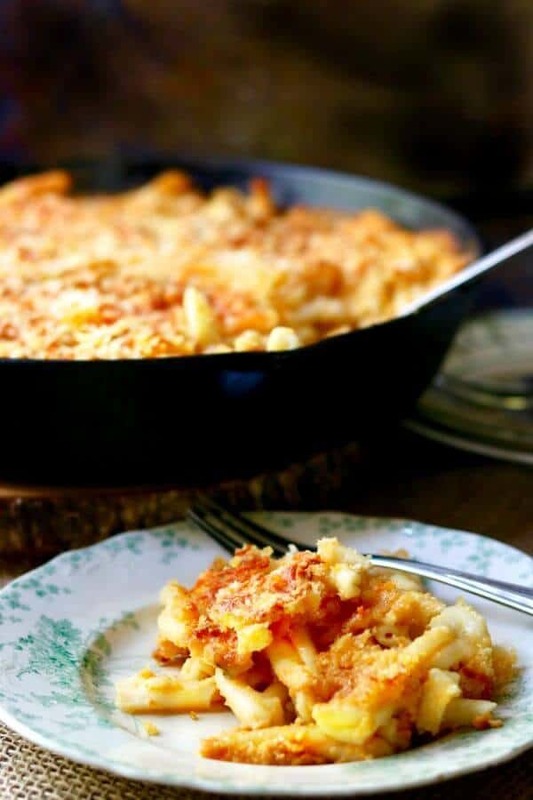 Well this Southern baked macaroni and cheese recipe is sort of a combination of the two of them. Creamy sauce and big, melty squares of oozy cheese both find their way into the dish. The beer flavor is not overwhelming here – the slight bitterness from the beer cuts through the luxuriously velvety sauce and keeps it from being too rich. I don’t know about you but I’ve had macaroni and cheese where the sauce coated your mouth and you literally couldn’t taste anything – it made it sort of bland. Well, the beer keeps that from happening here. The secrets to amazing macaroni and cheese is something Southern cooks are often pretty tight lipped about. After all, we have an image to uphold and we are a competitive bunch. When five dishes of mac and cheese are lined up at the church potluck we want ours to be the one that gets emptied first. Well, I’m counting on the fact that none of y’all live close enough to me to encroach on my macaroni and cheese status. Here are some of my best tips for the most delicious mac and cheese you’ve ever tasted. Use evaporated milk. It makes creamy recipes creamier without a lot of extra fat. Our moms and grandmas knew it but it seems to have been forgotten by most of us. Use a variety of cheeses. Sharp cheddar, smoked cheddar or Gouda, some Monterey Jack… experiment with combinations until you come up with something that you really love. Overcook the macaroni a little. Oh, not enough to turn it to mush but just past the a la dente stage. It will soak up more flavor and take on a better texture – trust me on this. 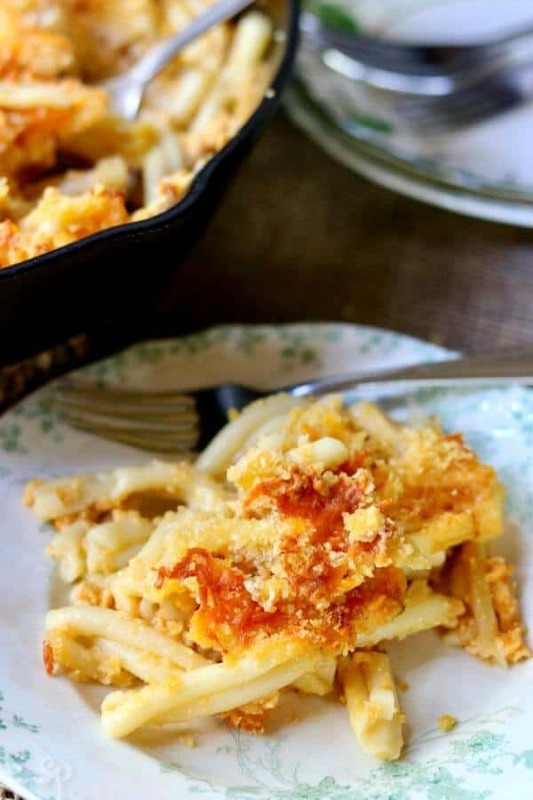 Bread crumbs baked on top take any mac and cheese recipe out of the mundane and into the wow. Be sure to salt the water that you’re cooking the macaroni in – and salt it well. Do you cover baked macaroni and cheese in the oven? Nope. You want the top to get crispy and golden. Covering it would make it soggy. Can you make baked macaroni and cheese from a box? If you must because you are short on time or money you can make baked macaroni and cheese from a box. Make it according to directions, add to a greased casserole dish, stir in about 1 cup of cubed sharp cheddar, and top with breadcrumbs. Bake at 375f for about 15 minutes. Can you freeze baked macaroni and cheese? Yes you can! Be sure to leave the breadcrumbs off, though. Cover your baked mac and cheese tightly with aluminum foil. Freeze for up to 2 months. To bake- Remove from the freezer and put in a 350F oven still covered with foil. Bake for 1 hour, uncover and add your breadcrumbs, then bake 15 to 20 minutes more. One of the most used items in my Restless Chipotle Kitchen is my Lodge Cast Iron Skillet!! It’s perfect for this dish! 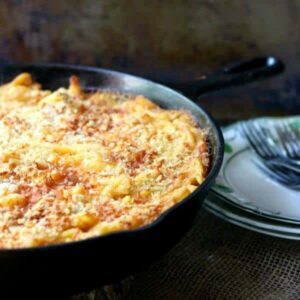 I love this mac and cheese baked right in an iron skillet – it develops a crispy crust on the bottom and sides and I think it has a better flavor. It’s great for Superbowl Sunday – and here’s more great ideas for Superbowl Sunday.If you love this recipe please give it 5 stars! Southern baked macaroni and cheese with beer is creamy, gooey-cheesy with a crispy topping like the old fashioned mac and cheese recipe your kids love! Cook pasta in salted boiling water – about 12 minutes. Melt butter in a saucepan over medium high heat. Whisk in flour and cook, stirring constantly, until golden – about 2 minutes. Add the milk and the beer, whisking constantly. Add both cheeses and stir with a wooden spatula or spoon until melted. Simmer the cheese mixture for 5 minutes or so – just until it thickens slightly. Stir in the pepper and smoked paprika. 10. Spoon the mixture into a large, greased iron skillet or casserole dish. 11. Top with bread crumbs. 12. Bake for 30 minutes or until the dish is bubbling and has browned on top. 13. Let stand a few minutes before serving. 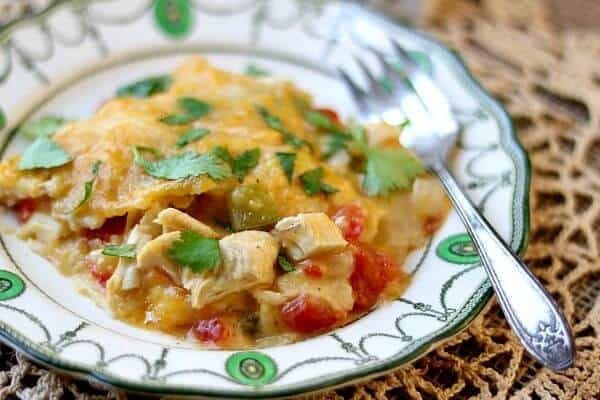 This recipe is part of Meal Plan Monday! Head over and check it out.